Lay parchment paper inside the tray and cut the corner to fit it in. Mix butter, sugar, egg white and flour in a bowl. Take a small part of it and add green colour or any fancy colour. Add cocoa powder to the remaining larger part. Put this in the baking tray and allow it to set in a refrigerator so it will not spread when sponge cake batter is added. Skipping this part is no big crime! The cake tastes great with or without it! Beat the eggs and powdered sugar with a wire whisk. Beat the mixture with an electric mixer for 5 minutes on high speed for it to turn fluffy. Then beat for 2 minutes on low speed to foam. Add sifted cake flour and fold in gently about 10 times with a spatula. Fold for about 50 times after adding milk. 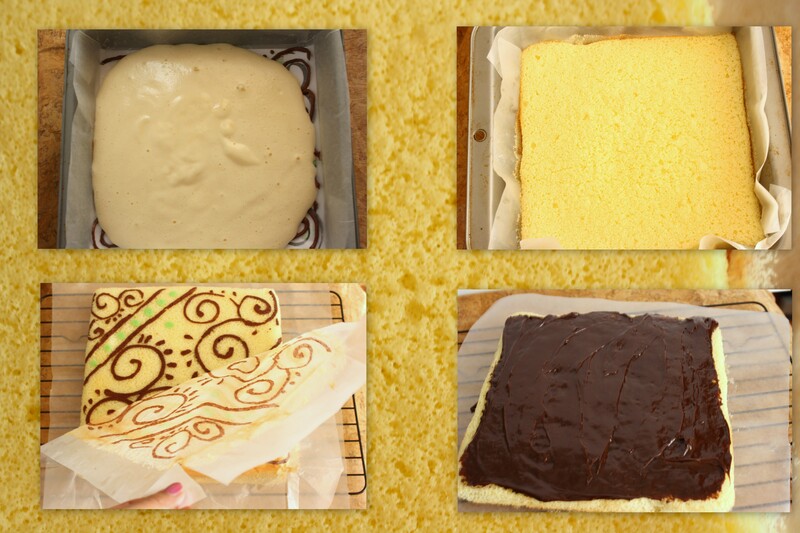 Remove baking tray from refrigerator and pour the batter into it. Spread it by tilting the tray to fill the corners. Drop tray gently on counter top to release any air bubbles trapped under. Bake it in a preheated oven at 350° F for 12 minutes. When baked, remove from oven and drop it gently on counter top to prevent shrinking. Remove cake holding the parchment paper and cool on a rack. 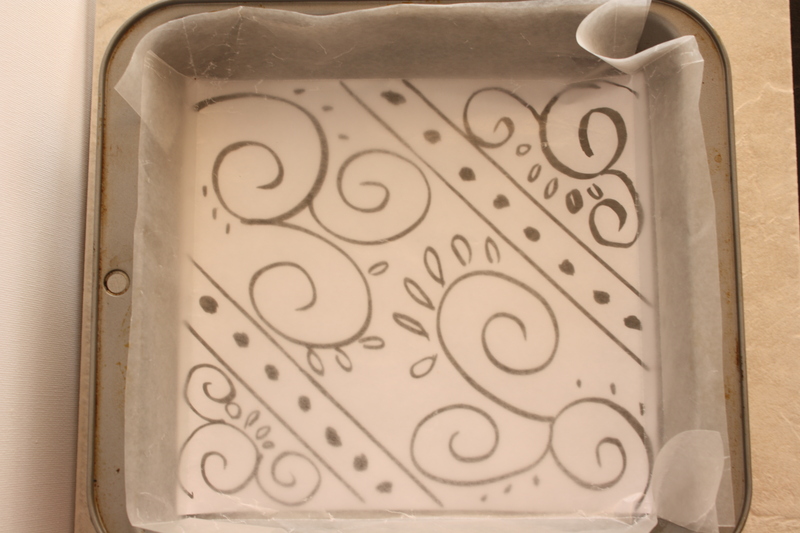 When it is warm to touch, invert the cake on another piece of parchment paper. 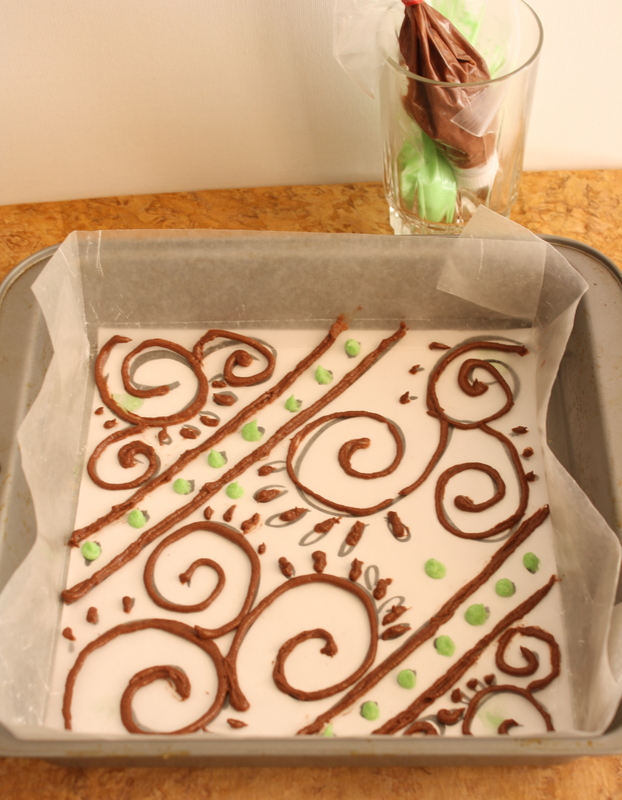 Gently pull out parchment paper to reveal the pattern on top. Turn the cake to the other side and spread chocolate frosting. Roll it and cover it with parchment paper tightly and place it in refrigerator for 30 minutes. Take the roll out and slice it into smaller pieces and serve. This roll cracked when rolled as I let it to cool longer, I guess. Have it with a cup of black tea without sugar to balance the taste. That is exactly what I did! 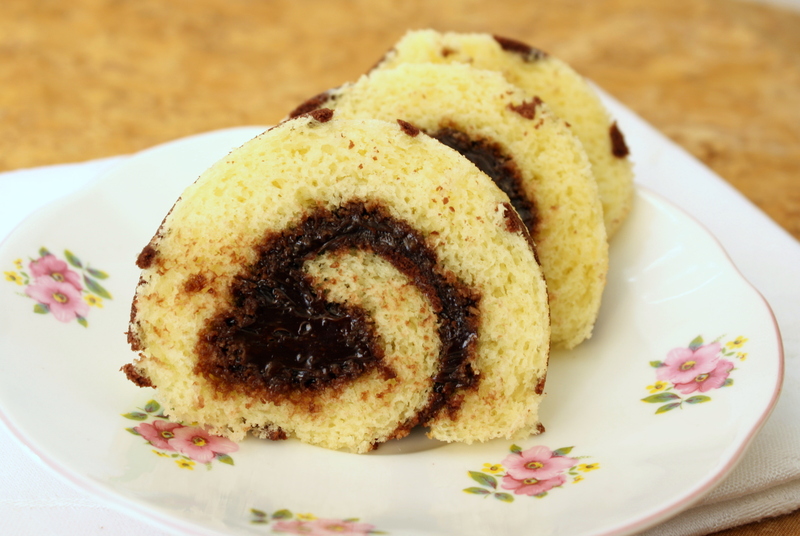 This entry was posted in Cake, Cake decoration, Dessert, Not just for kids, Snack and tagged jam roll, japanese cake roll, jelly roll, Sponge cake, Swiss roll. Bookmark the permalink. Just lovely! And what a great idea for decorating the outside of the roll! Thank you for such a quick review! I am still editing a few errors. You are great! I wish I could do the same with your recipes but I am a lazy one getting distracted by a thousand things around. Thank you for all the encouragement! Thank you! Do try it…you will be happy like me! Roulade is my all time favorite cake and I love the decoration you did. 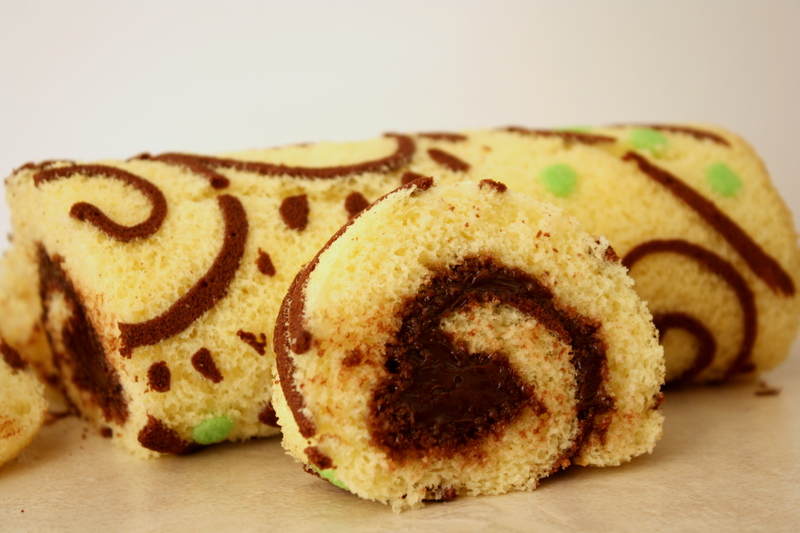 Here we go…Roulade is another name for this roll…never knew that before. Blogging is very informative! Thank you! I was in Vancouver last weekend…but was very busy so could not get in touch with you. I will meet with you next time. Hi dear….planning to make one like this designed one…just a clarification…does the decoration part need to be the batter or can it be buttercream….will it work out…any ideas…? Wow Sridevi! I’ve never seen that method for cakes. Thank you so much for sharing, and following my blog. I will be very happy to follow you as well and look forward to your next creation. Thank you, Julie! You are always welcome! You are quite an artist. I think your cake is stunning. You did an amazing job and your idea for decorating the outside of cake baking the decoration into the cake is brilliant. So the cake doesn’t crack you roll the cake in a clean tea towel while it is warm and let it cool rolled in the towel. When cool you spread the filling and roll again. It works well. That is a cool idea…will try that next time! Thank you, Suzanne! Oh this is so beautiful, and the cake looks so perfect light and spongy! 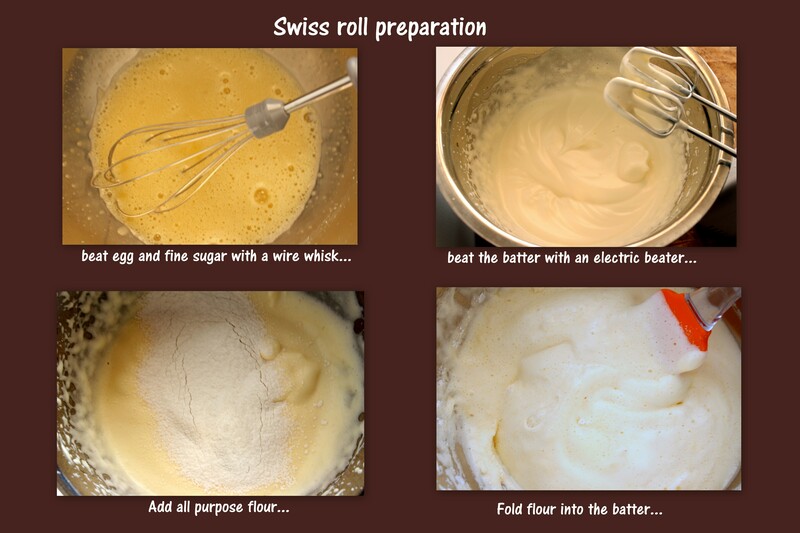 My dream at the moment is to make a nice rolled cake, so I think I’ll have a go at this cake recipe sometime! 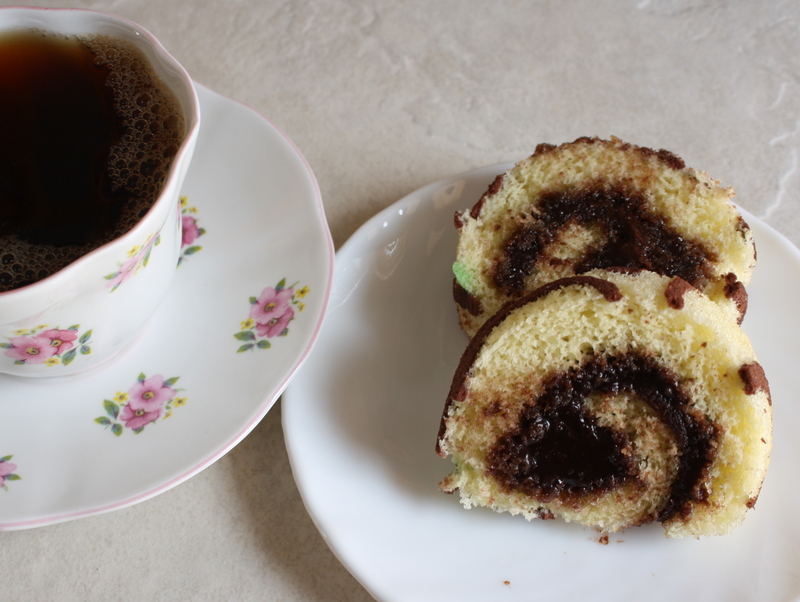 I was skeptic about making this cake but the Japanese roll cake recipe helped me muster some courage. Try it…you will be amazed too! I just made it–the cake was fantastic! It rolled beautifully and I really liked the size. The only problem was my filling… I did some sort of meringue-y thing and it was a failure! Haha, so I’ll try again…at least I now have a good cake recipe to use 🙂 Thanks so much for sharing!! How would I convert the measurements to bake this in a 15″x10″ jelly roll pan? I am not sure about converting the measurements. I assure, it can be doubled for a larger roll. As I mentioned, it was my first trial and I took a pan just eyeballing according to the amount of batter I had. Try this recipe. It won’t crack even after the it’s cooled. Good luck!